I don’t get people who run around miserable all the time. I do have my moments, but constantly? I don’t get it. I can understand that our recent weather would be enough to put most people in a mood, but it will pass. The same as absolutely everything else. Everything. Sunshine can certainly improve how you feel, but what about when it’s not available? I find when it’s miserable outside a good way to lift your mood is with comforting food. It works in the winter too. We are having at least our sixth day of overcast and/or rainy weather in a row, so it’s time to pull out the big guns. I had a meeting in Blockhouse yesterday and was lucky enough to purchase some garlic scapes at the farmers market. Garlic scapes are the curled green tops of hard neck garlic. I thought that cutting them off would ruin the production of the garlic bulb, but the opposite is true. The ‘scape” starts to grow after the leaves form on the garlic. It’s like a firm green looped tube coming up from the centre. If left alone they do not flower but form bulbils that can be planted. But like lilies, they take several years to form harvestable garlic bulbs, and their development saps energy from forming the bulb in the ground. So most gardeners cut them off and throw them away. Nooooo!!!!! They’re delicious and highly undervalued in the kitchen. The easiest way to cook them is to chop into bean-like lengths and sauté in butter or olive oil. You can do more complex things as well. They taste faintly garlicky. Not much at all, really, in my opinion. They're only available for a short time. But back to frying. I had some chicken thighs. If you want to “fake” good weather indoors try a recipe from somewhere sunny. Of course that could be pretty much anywhere but here. I chose something Mediterranean. Lemons slices are the colour of sunshine. Maybe they can be a good temporary substitute? And how about some oregano? Instant Mediterranean flavours. This recipe is modified from one I found in Bonapetit, but it doesn’t bear a whole lot of resemblance to the original. My preparation technique and final sauce are substantially different. I found that the lemon was an integral flavour to the dish. Don't toss them. Eat them. 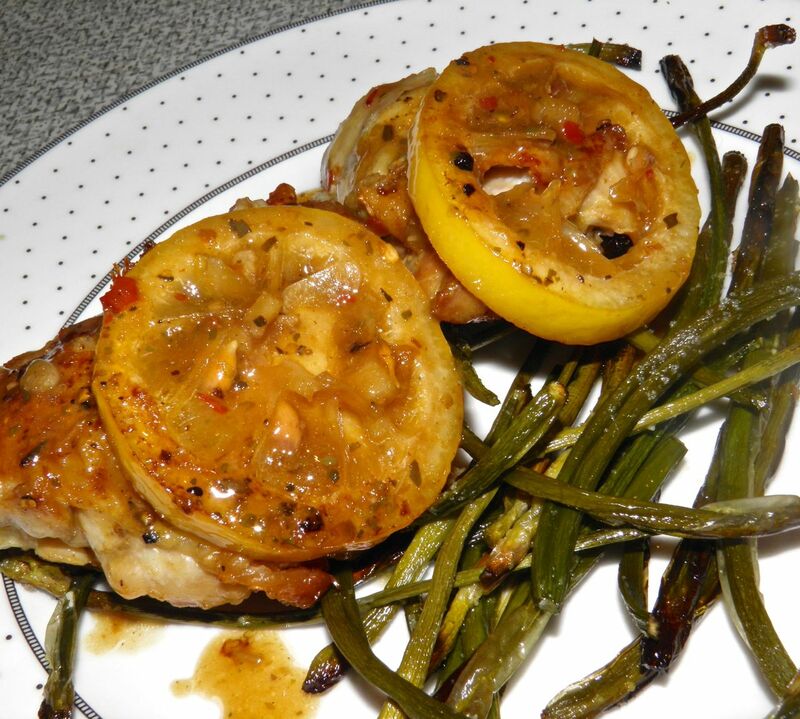 Try a little bit of lemon rind with mouthfuls of the chicken. The caramelization lends a lot of sweetness. You’ll be surprised how this simple meal can lift your overcast mood. Cut the garlic scapes into thirds. Place on parchment paper on a baking sheet. Sprinkle with the olive oil and a little salt. Roast scapes, about 10 minutes before chicken goes in. Fry the chicken skin side up in a dry oven-proof pan. No need to add anything to the pan. The fat will render out as the chicken browns. Season the top with salt and pepper. Once the chicken releases turn it and do the same to the skin side. Remove to a plate. A lot of fat will have rendered out. Pour off all but about 1-1/2 tbsp of the fat. Slice the lemon into 1/4” inch thick pieces and line the bottom of the frying pan with them. Sauté until the slices start to brown. Meanwhile mix together the oregano, garlic, chilli, wine broth and cornstarch. 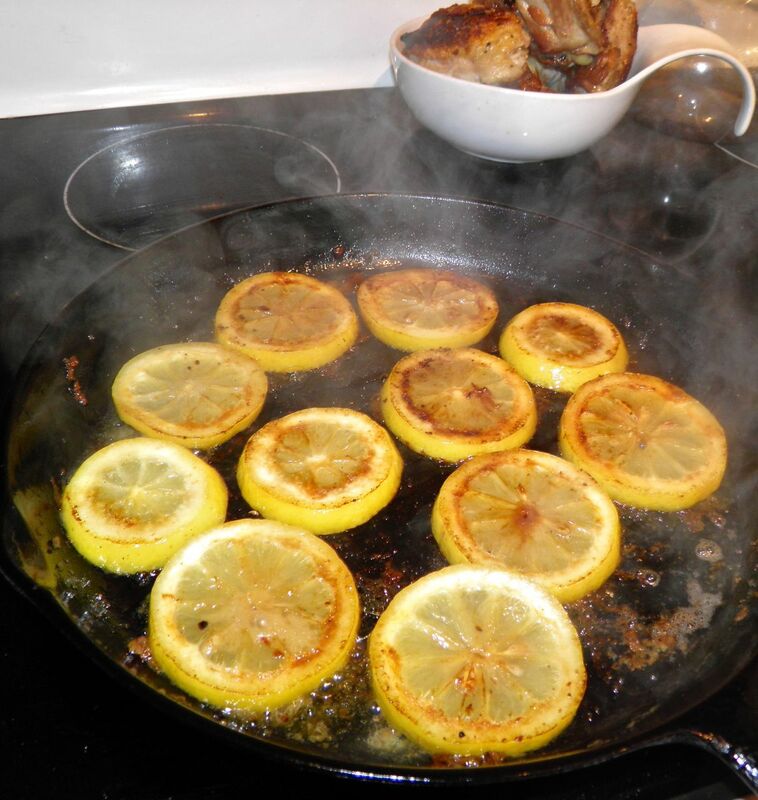 Turn the lemon slices in the pan and pour in the liquid. Bring to a boil, top the slices with the browned chicken. Place the pan in the oven and bake for 30 minutes. Continue to keep an eye on the scapes. If they begin to brown too much remove them from the oven. They may only take 1/2 hour depending on how big they are. 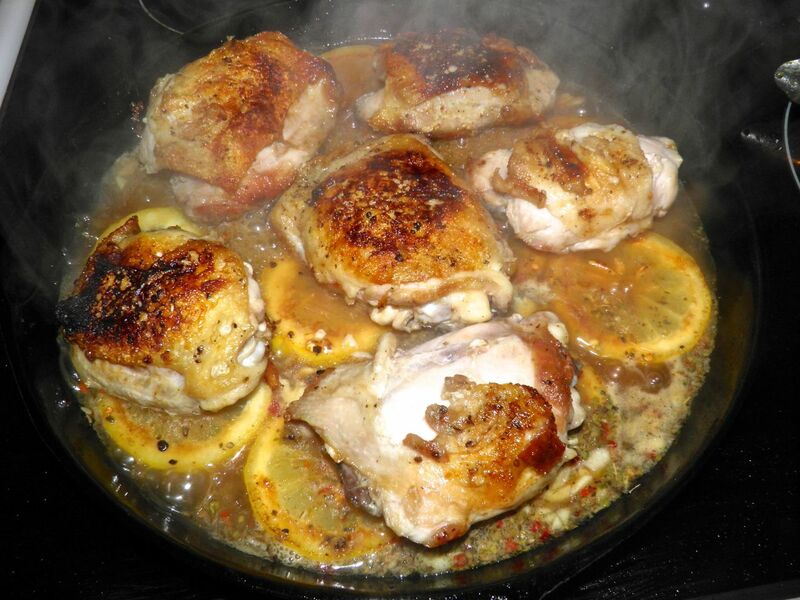 Once the time for the chicken has elapsed, remove the pan from the oven and check the consistency of the sauce. If it is too thin, remove the chicken and simmer the sauce on the stovetop for a short time to reduce. Remove the lemon slices if you prefer. 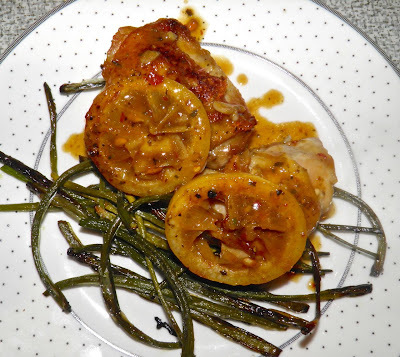 Plate the garlic scapes and serve the chicken with the sauce on top. Beautiful recipe - AND it's gluten free!